Although Hamilton Island is a family friendly holiday destination, you won't find screaming babies and toddler tantrums here. In fact, the island is wonderfully relaxing and has a friendly, laidback vibe that's perfect for a family holiday. It's so easy to keep the kids entertained all day while still enjoying some relaxing time for the grown-ups. There are huge range of family friendly activities to choose from on Hamilton Island, however here are the top 10 things to do with kids. Kids love getting wet and with gorgeous weather year round, it's always the perfect time for a dip on Hamilton Island. The resort pools are heated in winter and guests of the island have free use of a number of the beautiful pools found on the resort side of the island. In fact, you could spend the whole day pool hopping and never get bored. Spending a lot of time swimming has another added bonus too - by bedtime the kids will be exhausted and will slip off to sleep peacefully and quietly. One of the most distinctive things about Hamilton Island are the ever-present, softly humming buggies. Giving the island a relaxed and breezy feel, you can hire the buggies by the hour, daily and even overnight. They're very easy to drive and there are two-seater and four-seater options available. The kids love cruising around the island in the buggies, it's a great way to explore the island and certainly a bit of a novelty for them. The buggies are also a bit of a lifesaver by the end of the day when everyone is tired. Although sunsets on Hamilton Island are known as being particularly spectacular, the view from One Tree Hill is one of the best. There is a bar which serves drinks and nibbles, however you can also take your own drinks and snacks, with plenty of child-friendly casual seating at the lookout. The magnificent view will have you in holiday mode in no time and you might be surprised how much the kids actually enjoy this one. We recommend the buggy for this one as the hill is quite gruelling on foot, however if you're feeling energetic you'll probably still want a pram for the kids to minimise any whinging. You'll want to spend plenty of time on Catseye Beach, not just swimming but making the most of the beach activities and equipment for hire. There's plenty to do and something to suit all ages including sea kayaks, stand-up paddle boards, windsurfers and catamarans. The quality equipment is free to hire for families staying at Palm Bungalows, the Reef View Hotel and the Hamilton Island Holiday Homes. Junior life vests and beach lockers are also available for a small fee but can make a big difference. If you're lucky, you might even spot some of the sea turtles that frequent the waters around the beach! The idea of taking young children out into the middle of the ocean all day can seem a little daunting, but you can't visit Hamilton Island without enjoying a trip to the Great Barrier Reef. There are plenty of family friendly tours to the reef and beautiful Whitehaven Beach and the kids will have a ball going for a ride on a boat and exploring the weird and wonderful creatures of the deep. The trip will be a highlight for the whole family and it's something they can tick off their bucket list from an early age. With so many fantastic dining options available on Hamilton Island, eating totally counts as an activity. There are great choices with families in mind with everything from good quality takeaway to finer dining restaurants all happily welcoming families. The kids menus are generous and diverse, and kids up to 12 years eat free at participating restaurants when dining with parents before 7.30pm for guests of Palm Bungalows, the Reef View Hotel or Hamilton Island Holiday Homes. Just be sure to book ahead and book early. On Sundays head down to the marina with a picnic and rug for live music at sunset, the perfect kid-friendly place to meet new friends. WILD LIFE Hamilton Island offers the unique opportunity to wake up and eat breakfast right next to adorable, sleepy koalas. Kids absolutely love this activity, and if you're staying at the Reef View Hotel it's actually included as part of your stay. You can also stay on and visit the park after breakfast where you can get up close and personal with the rest of the wildlife, including lizards, snakes, kangaroos and even a crocodile. 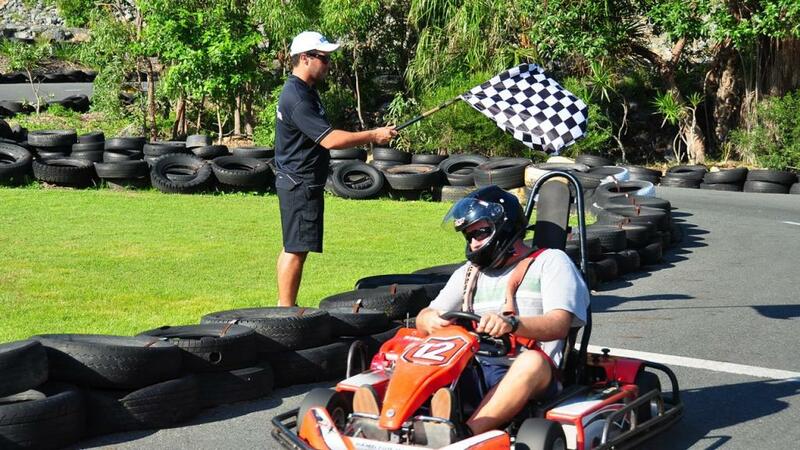 When you're ready to kick things up a notch, there's a great go-karting track that also caters for younger kids, as long as they are over four and can be accompanied by an adult in one of the duo-karts. Your little speed demons will get a huge kick out of this activity, and the staff are very helpful and friendly when it comes to organising the kids. If you're lucky you might even end up with the track to yourself. Your little minis will have a ball with this activity and it's a fun way to spend the day for younger and older children. The course it just challenging enough to provide a bit of fun and entertainment for the adults, but also easy enough for the kids to stay focussed for the entire 18 holes. This is a great activity for the whole family to enjoy some fun-filled quality time together. After plenty of quality family time together, don't forget to make use of the Clownfish Club for some precious adult down time. A welcoming environment for kids, a trusted team of childcare workers provide fun supervised activities while you enjoy a break. Whether for a few hours or a whole day, kids 6 weeks up to 14 years can have fun and make new friends while you enjoy a well-deserved rest.